The idea was to photograph around the Syracuse University campus with late day golden sunlight. For most of the day it looked like the idea was a sound one until the clouds rolled in. As I walked around and waited for the building accent lights to come on, I visited again with the bronzed statue of President Lincoln I showed you earlier this year and the fascinating story of how the statue came to be placed at SU. In the photo I shared with you then, it was more a documentary photo with the addition of a couple of students to add scale. This time I took my time and tried different angles. To give the flat gray sky some texture, I used a high dynamic range set of photos to create an HDR image and an angle to focus on the statue’s hands. In this photo I see a man who knew he was going to be faced with the toughest decisions any President of the United States then and since has ever needed to. I wonder if he knew then it would cost him his life. Abraham Lincoln bronze statue in front of Maxwell Hall on the Syracuse University campus in Syracuse, New York. Click on Photo for Larger Image. I returned later and used the Tokina 11-16mm f/2.8 ultra wide angle lens for a long exposure photo. I liked the distortion effect of the lens which leaned in the buildings towards the statue and the small aperture creating the star bursts on the lights. The three quarter moon was a bonus. The hard lighting caused a harsh look to one of the most beloved Presidents. The kind of look needed to make the hard choices of Lincoln’s Presidency. 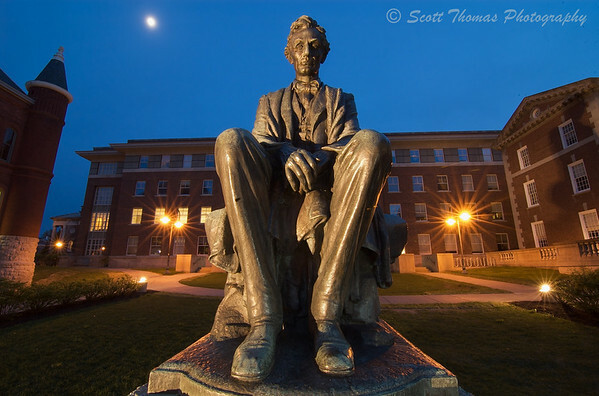 A long exposure night photo of the Lincoln statue on the Syracuse University campus using a wide angle lens. 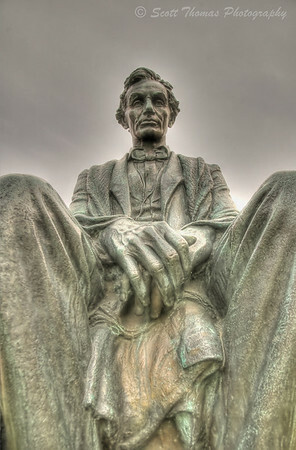 This entry was posted in Weekly View and tagged abraham lincoln, bronze, hdr, high dynamic range, new york, night, nikon D70, Photography, statue, syracuse, syracuse university, tokina 11-16mm, tripod. Bookmark the permalink. These are fine studies of how we see Lincoln. Someday I would like to find a Lincoln sculpture designed so that a person could sit next to him and look around at the world from his perspective. I’d like to know how Lincoln saw us. I particularly like the first photo, with just the president. I think you interpretation is really good, and when I read it I felt the same way. I the second one I like colors a lot. That’s my favorite of the two though they both say something to me. I guess that’s silly to think an inanimate object of someone who has been dead for over a century. Symbolism is a strong trait in us. Really amazing images, Scott! The angle and finish on the first one is top-notch and so powerful. The second one has a completely different feeling, but is just as strong. Well done! Thank you, Tracy. Trying to be more of a see-er lately. I was happy how these came out. Wow! Scott. I love the first photo of Lincoln with the concentration on his hands. I tried to do something similar in Gettysburg, but did not come any where near what you captured. Joe McNally always says the hands tell a lot about a person. Even as an interpreted piece of art, I feel these hands do the same. Which statue in Gettysburg did you photograph? I find getting in close helps a lot. Something most people don’t do even with a zoom lens. In this case, I was at 18mm and right at the base of the statue. Its funny, I often find photos affect me differently than the way other folks see them. While beautifully detailed, I find the first shot harsh. The second, although its still a statue, seems more real to me. I guess its because of the surroundings; the gray sky shot almost appears as though the background is a photographer’s backdrop in a studio. Hey, I am thrilled you see them differently. Nothing wrong with that. Nope, that’s not a photographer’s backdrop. The statue weighs over 2700 pounds and is 9 feet high. Can’t move it and I don’t have anything big enough to cover that expanse. What can I add that hasn’t already been said??? These photos are simply beautiful. The lighting, the colors, the perspectives…all wonderful! Wow, these are beautiful shots. I love the texture and the lighting. I like the angle of the first one and I also like how lighting in the second one. I like these photos very much, especially the second one. Thanks, Terry. I really like the Tokina lens. I even tilted it to get the distortion of the buildings leaning in. The gray sky I worked on in Photomatix which is the program I use for the High Dynamic Range (HDR) processing. It was a beautiful night at SU and lights do give the photo that kind of feel. Both photos are striking and each with its own perspective. I love Lincoln’s hands in the first image and I like the moody feel in the second image. He, Lincoln, alone had to make some tough decisions and probably spent many long nights doing so. Though not as worked into art like you do. I kept thinking it came out like something you or Preston might do. Funny how must of us see President Lincoln here. Even me. In fact, this statue depicts a younger Lincoln as he had a beard when he ran and became President. Still, it shows he was already weighing deep thoughts at this time. I love how his legs are open and it feels like he’s a real human person (and not just a president. If you know what I mean.) The difference in his face is striking between the two photos. I love reading your blog, Scott, because you really inspire us photographically. I mean that. Thank you, Kathy. Well, he was not the President in this statue (no beard) so he was a private citizen in this time frame. I like both photos, and the first one you really captured the emotion and mood that brings us back in time, almost like a cloud of storm hovering over the president. Perhaps it was a good thing that the clouds did roll in. As it turns out, our country needed that war to move forward. It was costly and the lessons are still being learned from it to this day. I love both of these. Nice job! I do love the angle and the look of the first one! Thanks for stopping by and commenting, Jan! Yes, working with different angles is fantastic, I like to do these with trees, we don’t have too many big statues, well apart from a gumboots and some Italian pioneers, must get round to photographing that actually. It’s amazing what an important role lighting plays in a viewer’s emotional response to a subject. Wonderfully creative photography, Scott. I don’t have a wide angle lens yet, but your photos tempt me to make the purchase. When I do, I’ll come back to your blog for ideas on how to use it. You have a wonderful gift for filling your photos with emotional impact. These photos of Lincoln’s statue speak volumes.